Burnley keeper Diego Penny has left the Championship club by mutual consent. The 26-year-old Peru international signed from Coronel Bolognesi in 2008 but made just four appearances, including one in the Premier League. He told the club website: "I will never forget Burnley because it was a great step up for me. 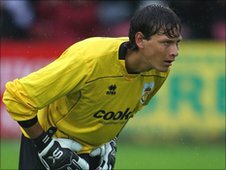 "It didn't happen for me but I do think I pushed Brian [Jensen, first-choice keeper] to be the best he could and Burnley have benefited from that." Penny added: "I am sad I didn't play more times. I think in football the most important thing is playing regularly but I tried to do my best every single day."